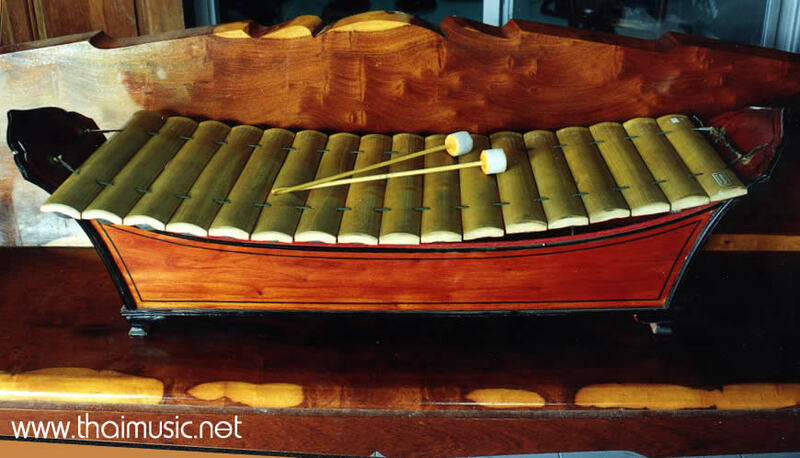 Ranart Thum , Thai style bass wooden xylophone. The Ranart thum was originated during the reign of King Rama 3rd. being modeled after the Ranat Ayk . The keys are made of a similar kind of wood or in some cases from bamboo. The keys are longer and wider than the Ranart Ayk and so have a deeper pitch. The body is also a different shape from the Ranart Ayk. It is shaped more like a wooden box with the two long top edges slightly curved. The two khon or end pieces extend upward past the top of the curved rims, sometimes curving outward slightly at the top. Between them the keyboard is suspended on its cord which is hung on the metal hooks on the end pieces. the length of the instrument is 126 cm. The width of the open top of the box shaped body is 29 cm. There are short legs at each corner to which castors are sometimes attached to facilitate moving the instrument around. the instrument has 17 or 18 keys , that of the lowest tone measuring 42 cm. by 6 cm. The keys decrease gradually in size, that of the highest tone measuring 35.5 cm.by 5 cm. The knobs on the ends of the playing sticks used on the ranat thum are larger and heavier than those on the playing sticks used on the ranat ayk, and only the soft sticks are used on the ranat thum.